When I think about it, things have been going pretty well lately. 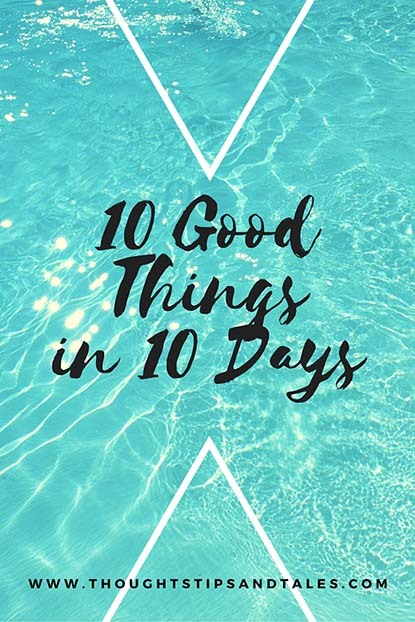 Here are 10 good things that happened in the last 10 days.1) Got to leave work an hour early on Friday, missing a big storm and extending my relaxing evening. 2) Two people wrote me an email at work one day and said I was “awesome.” Always nice to hear that. 3) My ENT doctor actually had a nurse call me at home to see how I was feeling. (Keep getting sinus infections after sinus surgery last year.) That has never happened before and I was kind of touched. 4) BlogHer featured one of my posts (How to Move Without Breaking a Sweat) and I didn’t even know about it til I went to post another one there. Always a treat! 5) Got a really cute necklace at Kohl’s on sale, then 30 percent off that. Gotta love Kohl’s. 7) As a result, at my recent physical my “bad” blood levels went down into the “pretty good” range. My doctor seemed pleased and so was I. 9) Went to my parents’ house to celebrate my dad’s 91st birthday with him, my mom, my sister and brother-in-law. What a blessing! Love ya, dad. 10) My sister said she showed a picture of us to someone and the person said (about me), “Who’s that? She’s cute!” Great to get a compliment on how you look now and then. Hope things are looking good for you, too! This entry was posted in good things, life and tagged 10 good things, good things. Bookmark the permalink. Thanks for stopping by! Hope you have a great weekend, too!